Care workers 'were caught asleep' at care home Two workers at a care home in Buckinghamshire asked for forgiveness after being caught sleeping during their night shift, a court has heard. "> Two workers at a care home in Buckinghamshire asked for forgiveness after being caught sleeping during their night shift, a court has heard. Two workers at a care home in Buckinghamshire asked for forgiveness after being caught sleeping during their night shift, a court has heard. They were found by their managers at the Westlands Home in Olney. Titilayo Ajala, 56, of Penryn Avenue, Fishermead, Milton Keynes and Henretta Offae, 41, of St Chad's Road, Derby, deny 19 charges of ill treatment or neglect of a person who lacks capacity. Each charge relates to one resident at the home, Amersham Crown Court heard. The court was told the two workers were found asleep in armchairs in front of the TV in the early hours of 18 August 2011 by two of the managers at the home, which specialises in looking after people with dementia. 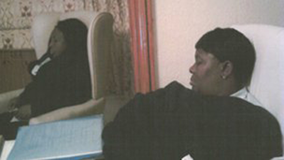 Giving evidence the team manager Barbara May said she and care home manager Salina Ballard went into the quiet room at about 02:40 BST and found Ms Ajala and Ms Offae asleep. Ms May said that in "quite a few" of the residents rooms the personal alarms had been disconnected. The two managers let them sleep and Ms Ballard took of a photograph of the pair on her phone, which was shown to the jury. Ms May said the pair woke when Ms Ballard said: "Good morning, ladies." Ms May told the court Ms Ajala said: "Oh my god Salina what are you doing here?" The managers reminded them they were not allowed to sleep during their night shifts. She said one of them could have rested - but not slept - on their own but not both sleeping together. Ms May said it amounted to gross misconduct and they were dismissed. She said Ms Ajala then said: "Forgive me, please forgive me..please give me another chance." And Ms Offae said: "We haven't got a leg to stand on... what we did is inexcusable.."
Ms May then took over the rest of the shift and checked on the residents - most of whom she said needed repositioning every one or two hours. She said some residents had double padded incontinence pads on and "some were very wet ".